TOP NOTES Luscious Mulberry, Black Peony Juicy – Sparkling – Addictive Delectable notes brim with luscious ripe berries to suffuse the heart with floral energy. HEART NOTES Blooming Jasmine, Tuberose Absolute Floral –Contrasting – Mysterious Beautiful, mysterious, nocturnal white blossoms add their olfactory radiance to the hypnotic character of the fragrance. BASE NOTES Black Musk, Patchouli Heart, Vetiver Enveloping – Luminous –Sensual Musk cloaked in black and textured woody scents infuse the identity of the fragrance, while they add feminine strength and charisma. The thrilling patchouli heart combines with the vibrant allure of vetiver roots. BEWITCHING BOTTLE Hypnotic and symbolic, Bulgari’s Serpenti is the enchanting spirit animal of the Goldea collection, its scales winding around the bottle top. Representing seduction and life, the sinewy serpent was a royal sign of strength for ancient queens. Today, the symbol lives eternal in Bulgari’s Serpenti, begun in the 1940s and now an icon. Scaled with Bulgari glamour, the black serpent coils around the Goldea, The Roman Night bottle, as its fragrance does a woman. Recalling the Roman sky, Goldea’s silhouette conjures those rare and precious moments when the sun, moon and Earth are perfectly aligned. Bulgari gently reinvents Goldea, The Roman Night’s roundness with a sleeker, more contemporary design. Subtly evoking the game of seduction, the bottle embraces contrasts to reinforce a mysterious allure. Encircled by a black line, the transparent cap tops the enchanting elixir. Its perfume box features an interlaced geometric pattern in a sensual open-mesh weave, to recall the tactile nature of Serpenti scales. Glittering with golden accents, it features sparkling diamonds, artfully set by Bulgari’s masterful jewellers. Shining like a scintillating woman, Goldea, The Roman Night embodies its queen of the Roman night. 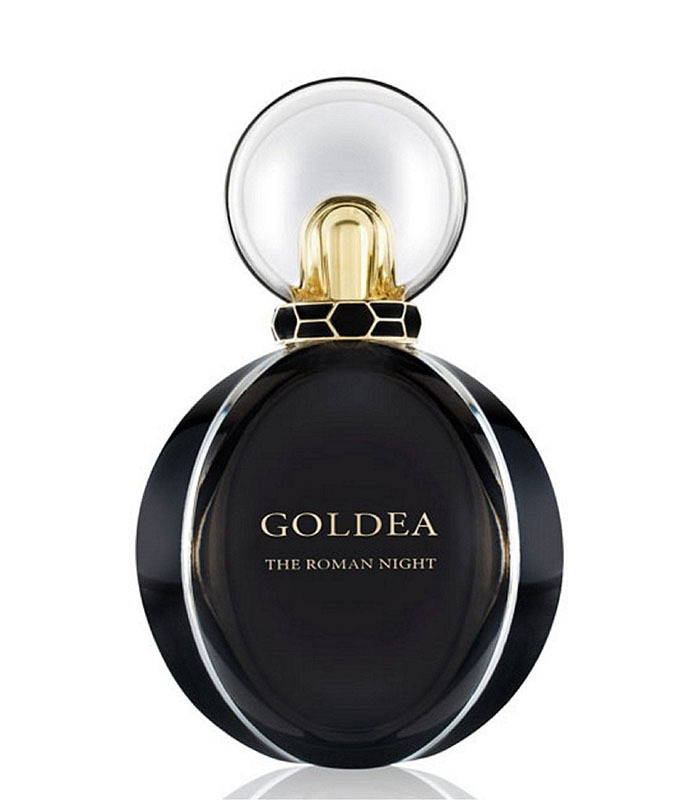 Goldea, The Roman Night is available beginning September 2017 for $95 (50ml) and $114 (75ml) at Bloomingdales and Bloomingdales.com.